On a beautiful hot sunny day like today, the last thing you want to be doing is preparing a demanding hot meal in the kitchen and switching on the oven to make you feel even hotter! Driving home from a lovely afternoon spent in the garden with a friend and her children, my mind automatically went to BBQ food when planning what I would cook for tea. Unfortunately, with hubby still at work, my BBQ skills leave much to be desired – mainly due to my tendency to panic at the sight of fire! Stoking up the BBQ definitely does not feature on my description of household duties. So, with my desire for BBQ food still unfulfilled and no veggie sausages or burgers in the freezer, I thought that I would take the plunge and attempt to make homemade burgers for the first time. I have always shied away from making my own burgers. I think it’s mainly because I don’t tend to eat many burgers myself as I always associate burgers with meat. I have also always thought that burgers are really difficult to make and beyond my cooking capabilities. However, today, armed with a recipe I found in The Quorn Kitchen, and because anything which involves cheese and onion mixed together is always a hit for me, I decided to have a go and see how I got on. The recipe was surprisingly easy to make. I added red pepper to the burgers to adapt them from the original recipe, and a pinch of basil along with the basil. I whizzed the breadcrumbs in the food processor and after cooking the burgers, I decided that actually the whole recipe could easily be made in the food processor rather than mixing manually to make the process quicker. The burgers were really tasty and a big hit with hubby and me, but surprisingly not with the kids. 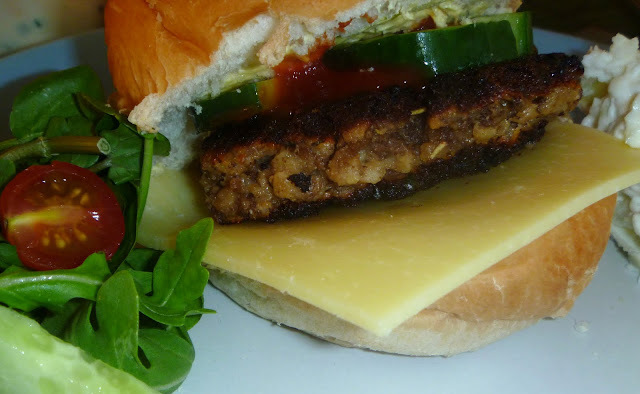 I have deduced lately that my kids tend to go for appearance rather than taste, so a burger that looked homemade or not like the smooth, perfectly rounded shop bought patty was a no no at the table – even though they had both taken great interest in what I was making and were amazed when I made the mixture into burgers. 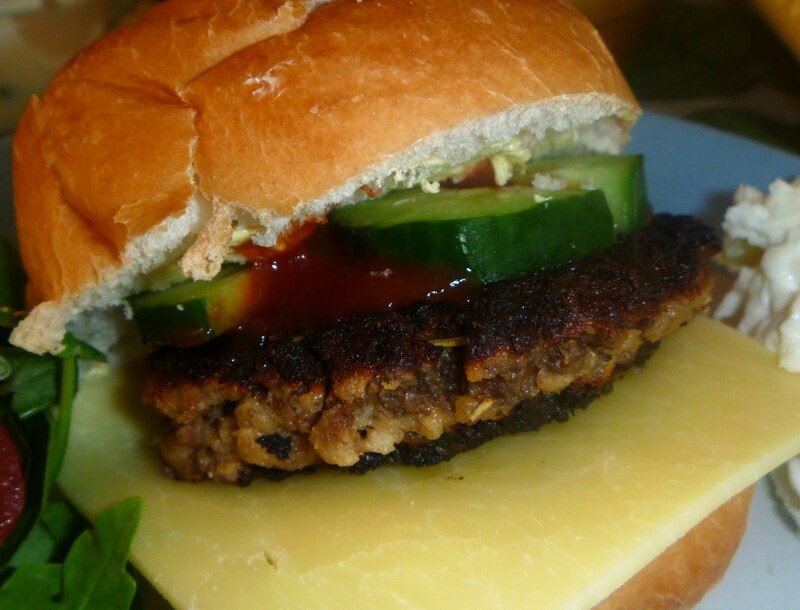 These burgers would be great for entertaining veggie friends or for a weekend meal. It did take me a while to prepare them, but I’m not sure whether it was because I was trying to supervise/entertain a 20 month old at the same time, which doesn’t really do much for preparing a quick meal! 1) Preheat the oil in a frying pan over a medium heat. Fry the onion, pepper and rosemary gently for 5 minutes, until the onion is softened, but not brown. I served our burgers with potato salad and some rocket, spinach and watercress salad, cucumber and tomatoes.